In 2008 the city of Augsburg and the MAN Group celebrated the 150th birthday of Rudolf Diesel, inventor of the diesel engine which was named after him. 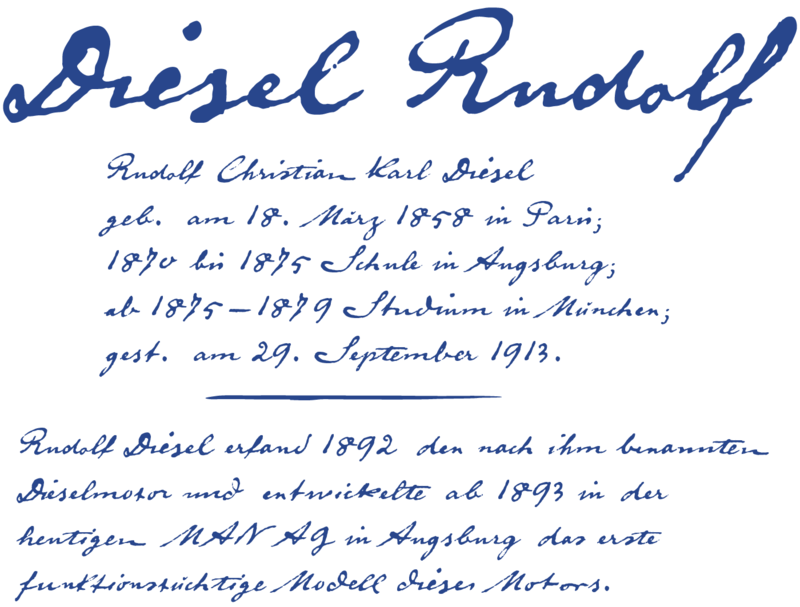 With the help of a few preserved original letters, it was possible to create a convincing digital version of Rudolf Diesel’s personal handwriting. The engineer and inventor Rudolf Diesel was born in Paris in 1858 and also went to school there. In1870 his family moved to England and Rudolf was sent to relatives in Augsburg where he continued going to school. Later, after completing his studies in Munich, he began working as an engineer in the machine factory Linde. Alone this part of his life makes clear why Rudolf Diesel’s handwriting was so ”jerky,“ hesitant and inconsistent. He learned to write according to the French style, that is, Latin cursive — completely different from the very correct and neat German handwriting taught at that time which he had to learn at 13 years of age. 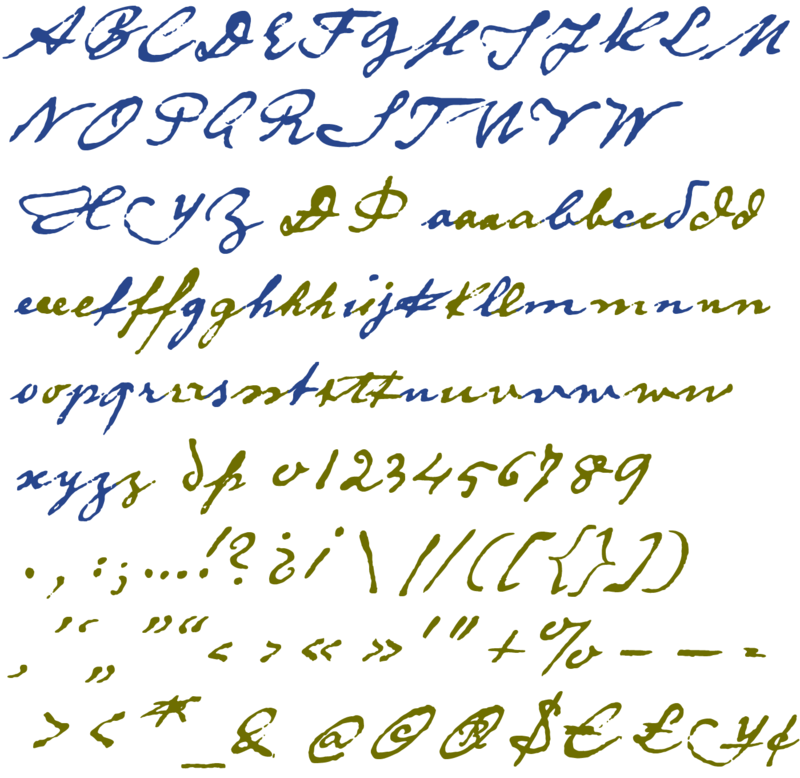 These circumstances explain why his handwriting is ”messy“ (especially for those days) with its mixtures of letter forms within a text, even within individual words. Plus, he obviously did not attach much importance to ”pretty writing.“ Sometimes the characters are wide, then narrow, sometimes large and clear and then again crammed and primitive. The individuality is emphasized with characteristics derived from quill and ink. The diversified images of the font Diesel Rudolf Script make more than 80 ligatures and stylistic alternates possible which can be selected with help from the OpenType functions Ligatures and Discretional Ligatures. 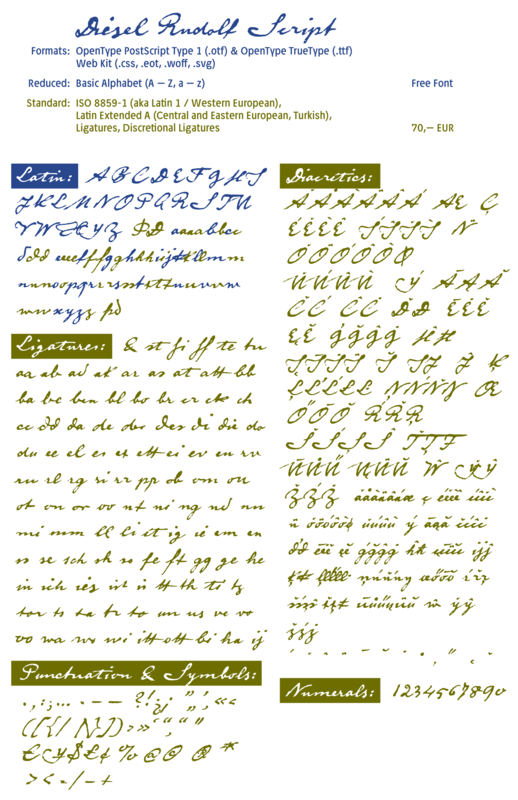 Requirements for the automatic application of ligatures: OpenType fonts can be used on your computer (Windows XP or newer; Macintosh OS X or newer), and your program suppors OpenType-Features (i.e. Adobe InDesign CS or newer). Of course, application of OpenType-Features must be activated in your program settings. As an example, when you enter the word “Diesel” the program replaces the character order i e or i e s and e l with the appropriate letter combination ie or ies and el. In this way the individual characters are only rarely repeated since they are most often replaced with a ligature. 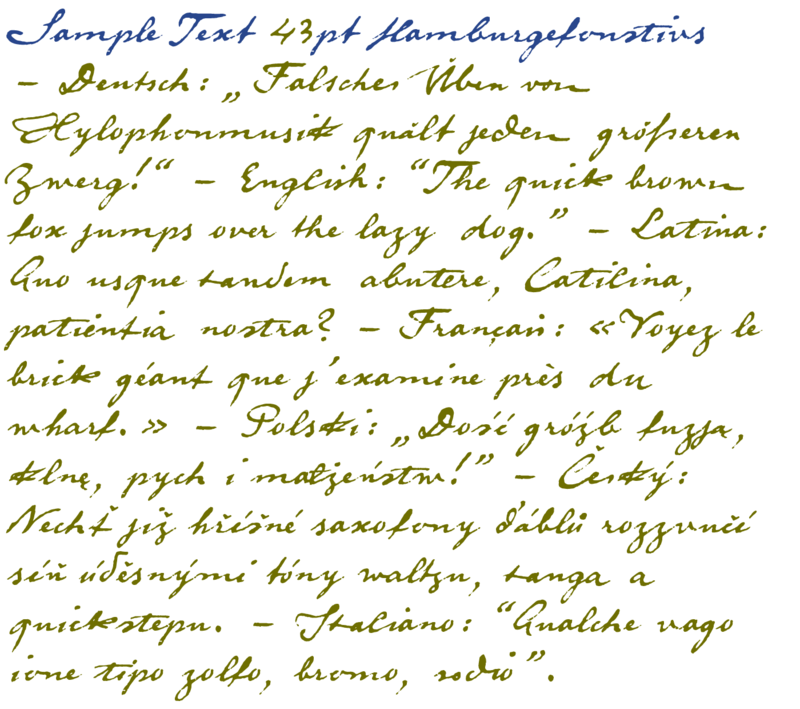 Diesel Rudolf Script comprises characters of all European languages with the Latin alphabet including Turkish.